Digital Fiber Mini Quilt- a great choice! 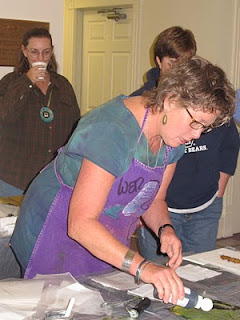 Basically, the workshop is a smaller version of my Segmented Fiber Quilts workshop. The workshop explores an innovative quilt presentation that folds! 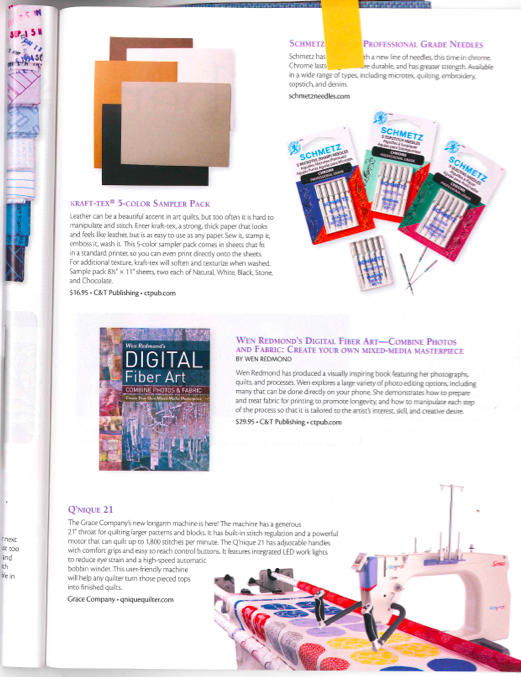 WS is based on Wen’s book, Digital Fiber, creating a segmented mini-fabric quilt with a photograph on inkjet ready fiber and inkjet printed! This is a 2 day workshop where participants can choose to make one or two 12x12 or less mini quilts. Student's personal photographs are printed on a collage of digitally prepared fabric or plain fabrics they bring from home. The fabrics should be thin but can be pretty much any natural fiber- not syntheic. InkAid will be introduced and used on that collage. The digital quilt will feature a new edge treatment that uses paint! Because the quilt is in segments, using the old-fashioned binding method just won’t work. It’s much too bulky. The unique segmented quilt lends itself to various configurations and presentations. Too much creative fun!! The painted edges yield a wonderful new textural accent to the finished segmented piece. 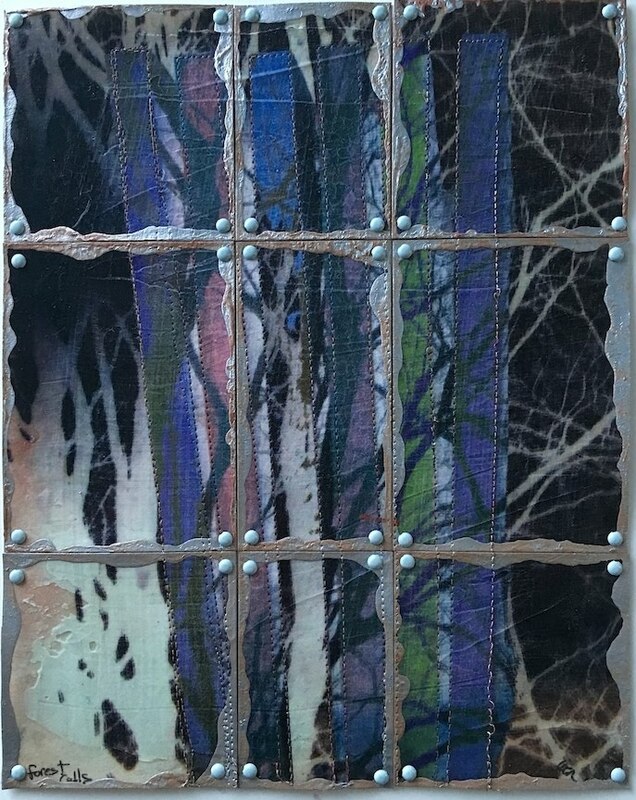 We will discuss how Wen prints on fabric, photographic enhancements and dividing a photo to create larger work. Seeing your photograph printed on the collage you created is So cool! 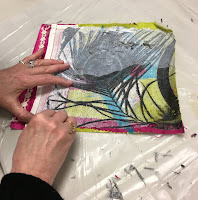 Besides learning about Wen’s protective coating and finishing techniques, the students will have the opportunity to try specialty medium enhancements for a unique mixed media mini quilt! Mix Creative Photo Transfer Collage! I love collage. 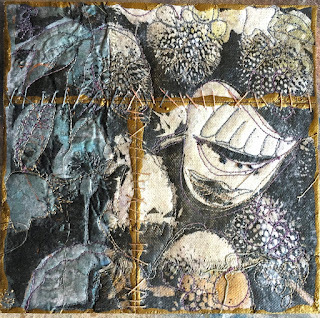 I love how you can use bits and pieces of treasured items, saved scraps, special papers and painted fabrics to create amazing works of collage art. 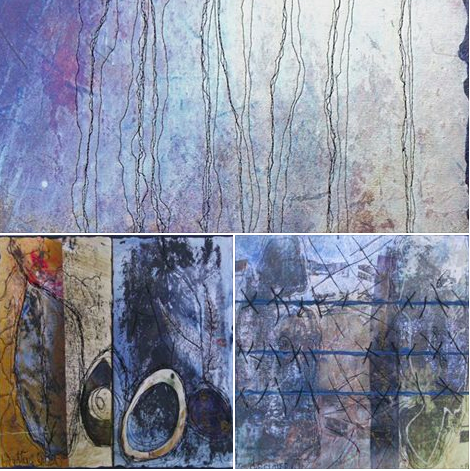 I like composing them and add drawing-like stitching on them. student working on transfer over a collage with vintage linens! 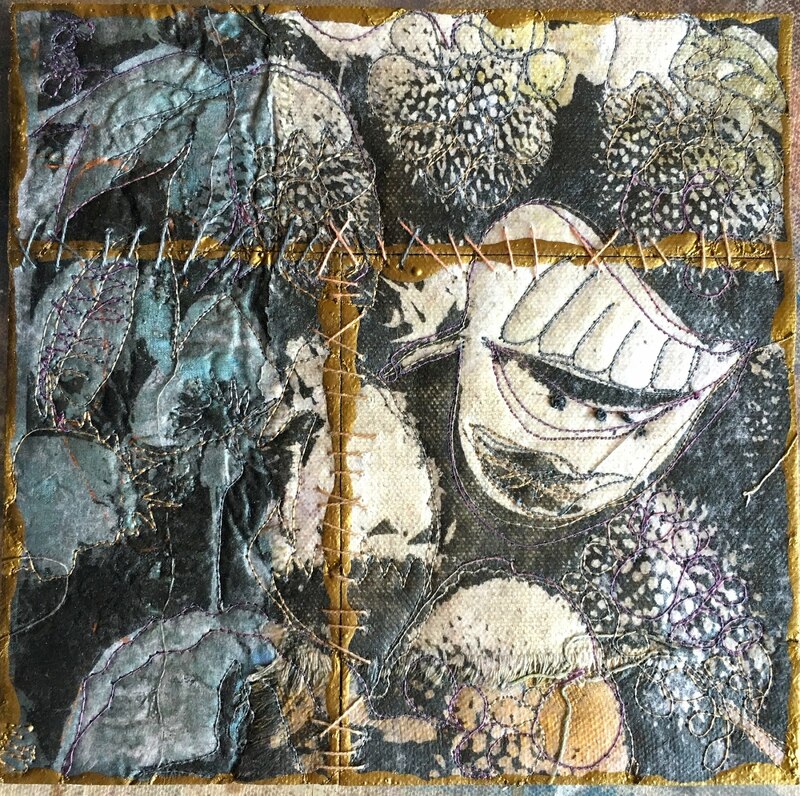 This workshop takes collage one step further by transferring a black and white image, printed on printed paper, over the top of the entire or part of the collage with “wow-ser” results! 2 different collage results using the same photo! I’ll show you my collage techniques and this simple transfer technique that will blow your collage out of the water. Excited? You bet! Fun and relaxing, I hope you’ll join me! 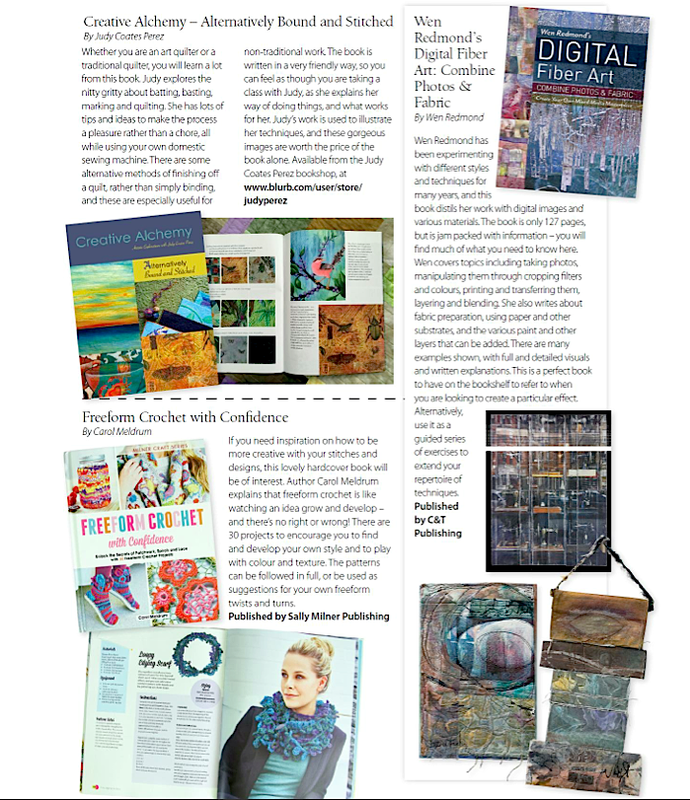 Joining Seth Apter in his no rules collaboration with art journaling. "ARTifacts: A Collaborative Project for 2017"
Journaling has been a part of my life, in one way or another, since I was a kid. Today, besides the joy of texturing & collaging pages, I convert them digitally! More in my new book, a labor of love!